When you’re not feeling well, you call the doctor. When your pet is sick, talk to our doctor. 107.7 The Bronc presents the first and only pet healthcare show in Mercer County. 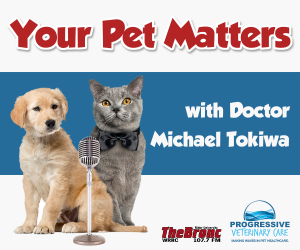 Tune in to Your Pet Matters with Dr. Michael Tokiwa of the Progressive Veterinary Care, formerly the Animal Hospital of Blawenburg or subscribe to their podcast. Your other family physician, Dr. T is on-call every Saturday at 10 a.m. to discuss your pets health. From wellness and prevention to diet and exercise, Dr. T. will use his veterinarian experience and knowledge to provide you and your family with the best medical advice, cutting edge medicinal techniques, natural remedies and alternative therapies to keep your dog’s tail wagging and your cat purring. Our pets are lifelong friends, don’t they deserve a lifelong wellness partner? Listen to Your Pet Matters with Dr. Michael Tokiwa of Progressive Veterinary Care, formerly the Animal Hospital of Blawenburg, Saturdays at 10 a.m. on 107.7 The Bronc. 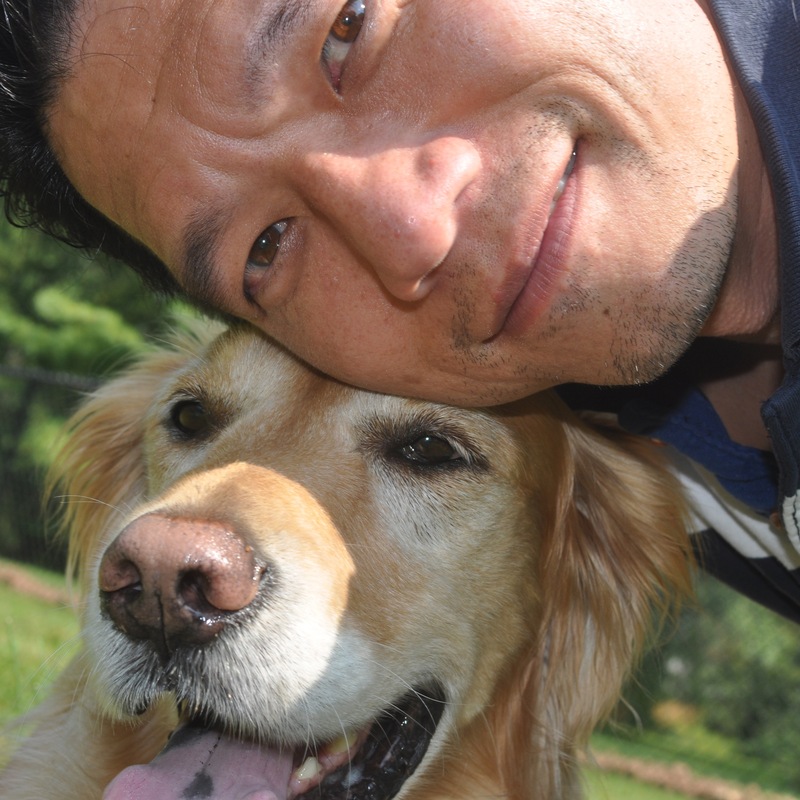 Click here for more information about Dr. Tokiwa and the staff at Progressive Veterinary Care. (Host) Dr. T is a veterinarian, business owner, and Medical Director of the Progressive Veterinary Care Family of Animal Hospitals. His real name is Michael Tokiwa, and he calls himself the CanAsian (guess the ancestry). He medically cares for dogs and cats, tweets and writes articles about his thoughts on a variety of subjects, teaches about veterinary medicine, drums on his kit or sometimes on his belly (for his son), he rides his Honda CBR or his mountain bike, and helps people understand the human animal bond. He’s kind-of everywhere, and you can find him at www.progressiveveterinarycare.com, his twitter, his linkedin, and his facebook. 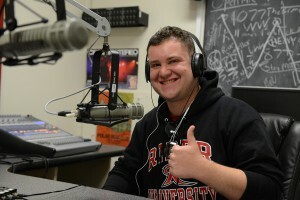 (Co-host/Producer) Matthew Mysholowsky is a student majoring in Filmmaking, TV, and Radio with a concentration in Radio. What Matthew enjoys about the radio station the most is that it gives him great experience for a future career in the radio industry. For him, radio is an excellent platform for both music and discussion, which are two things that Matthew really enjoys. Matthew’s many interests include playing video games and uploading his gaming videos to YouTube, music (specifically rock and old school hip-hop), MMA and pro wrestling. November 05, 2016 – Dr. T is joined by Jackie Petersen of Pet Plan Pet Insurance! – Oh yeah! That’s Jordan training with us today. September 17, 2016 – Melissa Conley from Westfield Veterinary Group joined us in studio today! September 10, 2016 – Check out Dr. T and Dr. Justine Lee joining us via Skype from Saint Paul, Minnesota. August 27, 2016 – Dr. T is joined in studio by Dr. John Lewis of NorthStar Vets. Dr. John Lewis, head of the department of dentistry at NorthStar Vets visited us in studio today sharing his best expertise and knowledge about veterinary dentistry. August 20, 2016 – Dr. T and Jacki Skole in our studio. August 13, 2016 – Dr. T joined by Dr. Brady Beale, Veterinary Ophthalmologist at U Penn, in our studio. Dr. T is joined by Dr. Garret Pachtinger, Co-founder and COO of VETgirl, Veterinary Trauma Director at VSEC and House Officer Director for BluePearl. July 30, 2016 – Dr. T and Veterinary Ophthalmologist Dr. Kristina Vygantas with her children! Dr. Kristina Vygantas of NorthStar Vets joined us at the Terhune Orchards’ “Just Peachy Festival.” We broadcasted LIVE and got to discuss about pet’s vision, signs to look out for and all the different vision related health issues that affect dogs and cats. July 23rd, 2016 – Dr. T is joined by Skip’s for Dogs owners John and Kylee Formento. Today’s discussion is about John and Kylee’s mission to bring more toys to more dogs as they donate a toy to a dog in need at a local shelter or rescue through their company Skip’s for Dogs. Today’s discussion was about the field of Veterinary Social Work and the importance of the emotional support available to pet owners facing trauma or loss. Broadcasting LIVE from Trenton Farmers’ Market Dr. T and Dr. Jennifer Kim of NorthStar VETS talk about oncology, cancer, treatments and more! May 07, 2016 – Dr. Ian Spiegel, Veterinary Dermatologist and Dr. T broadcasting LIVE from our studio. Dr. T is joined by Dr. Ian Spiegel of Veterinary Specialty and Emergency Center. April 23, 2016 – Dr. Marie Holowaychuck joined us from Calgary, Canada. Dr. T is joined by Dr. Marie Holowaychuck of Critical Vet Care. February 27, 2016 – Dr. Lisa Fink comes to visit! Dr. Tommy Monaco comes to visit! Dr. T. is joined by Dr. Tommy Monaco of Katonah Bedfield Veterinary Services! Chantal Cartier, Lyn Robinson, and Stephanie Kowalewski come to visit! Dr. T. with Chantal Cartier of Maverick Pet Partner, Lyn Robinson of Live and Learn Dogs and Heavenly Hounds Dog Training, and Stephanie Kowalewski, the owner of Heavenly Hounds Dog Training! Chantal Cartier and Lyn Robinson come to visit! Dr. T. with Chantal Cartier of Maverick Pet Partners and Lyn Robinson of Live and Learn Dogs and Heavenly Hounds Dog Training! Dr. Georgia Arvanitis comes to visit! Dr. T. with Dr. Georgia Arvanitis, the Vice President of The Easel Animal Rescue League! Dr. Peter Chapman comes to visit! Dr. T. with Dr. Peter Chapman of V-Sec! Rob Gillette Comes to Visit! Dr. T. with Rob Gillette of Red Bank Veterinary Hospital! Dr. Sarah Boston visits via Skype! Dr. T. with Dr. Sarah Boston, writer of her memoir Lucky Dog: How Being a Veterinarian Saved my Life. You can find Lucky Dog on Amazon. November 7th, 2015 – Clarissa Lyon of Merial Field Veterinary Services comes to visit! Dr. T. with Clarissa Lyon of Merial Field Veterinary Services! Jennifer Kim of NorthStar Vets comes to visit! Dr. T. with Oncologist Jennifer Kim of NorthStar Vets! Your Pet Matters Live at the Hamilton Area’s YMCA’s Run to Raise! Dr. T. and Matt with the CEO of the Hamilton Area’s YMCA discussing the future of the Run to Raise 5K! Dr. T. with Stephanie Kowalewski of Heavenly Hounds Dog Training in Lawrenceville! Molly Sumner of Kindred Companions LLC comes to visit! Dr. T. with Molly Sumner of Kindred Companions LLC and Yellow Dog Pet Supply! The Dog Trainers, Stephanie and Adrienne, Come to Visit! Dr. T. with Stephanie Kowalewski of Heavenly Hounds Dog Training in Lawrenceville and Adrienne Carson of Live and Learn Dogs! Live from Heavenly Hounds Dog Training! Your Pet Matters was LIVE from Heavenly Hounds Dog Training in Lawrenceville! Stephanie and Chantal come to visit!! August 8, 2015 – Ernie Katris of Elive Pet Products comes to visit! Dr. T. with Ernie Katris of Elive Pet Products via Skype! Red Bank Veterinary Hospital At Home Care Team comes to visit! Dr. T. with Dr. Avery, Dr. Smith, and Technician Lauren of Red Bank Veterinary Hospital! July 18, 2015 – Dr. Andrea Caniglia of CARE comes to visit! Dr. T. with Dr. Andrea Caniglia, the veterinary anesthesiologist at CARE, the Center for Animal Referral and Emergency Services! Dr. Ira Gordon of The Oncology Service comes to visit! Dr. T. with Dr. Ira Gordon, a veterinary radiation oncologist with The Oncology Service. June 13, 2015 – Live from Rider Reunions Day with Heather Troyer! Dr. T. and Heather Troyer of Oradell Animal Hospital LIVE are Rider Reunions Day! June 13, 2015 – Live at Rider Reunions Day with Heathery Troyer! June 6, 2015 – Dr. Michael Brown comes to visit! Dr. T. with Dr. Michael Brown of Crown Veterinary Specialists, Animerge, and Animal Eyes of NJ! May 9, 2015 – Dr. Amanda Landis-Hanna with Voyce! Dr. T. with Dr. Amanda Landis-Hanna of My Dog’s Voyce via Skype! May 2, 2015 – West Windsor Police Department comes to visit! Dr. T. with Lt. Garofalo, Ptl Montgomery, and K9 Cherno! April 25, 2015 – Your Pet Matters visits Bark Now for Autism Speaks! Dr. T. and Matt with volunteer Emily Josephson! April 11, 2015 – Dr. Siobhan Haney comes to visit! Dr. T. with Dr. Siobhan Haney! April 4, 2015 – Dr. Elaine Holt comes to visit! Dr. T. with Dr. Elaine Holt DVM of Crown Veterinary Specialists. March 28, 2015 – Joseph DeFulio LVT comes to Visit! Dr. T. is joined by Joseph DeFulio LVT of Saint Francis Veterinary Center! March 21, 2015 – Steve Mehler of Hope Veterinary Services Visits! Dr. T. is joined by Steve Mehler of Hope Veterinary Services for a sweet 80’s cop pose! March 7, 2015 – Dr. Alane Calahane visits via Skype! Dr. T. with Dr. Alane Calahane, CEO of Veterinary Specialty Hospital of Hong Kong! Your Pet Matters set up at The Philadelphia Flower Show. Trish and Kurt Baker with their dogs! Dr. T gets a kiss! Dr. T. and Matt at the Philadelphia Flower Show! Dr. T., Matt, and Trish and Kurt Baker with their dogs at The Philadelphia Flower Show! February 21, 2015 – The Seeing Eye, Inc. comes to visit! Dr. T. is visited by Jill Jaycox, Melissa Baumgartner, and Howie of The Seeing Eye, Inc.! February 7, 2015 – Heavenly Hounds Trainers came to visit! Dr. T. with Stephanie Kowaleski of Heavenly Hounds Dog Training, Adrienne Carson of Live and Learn Dogs, and Chantal Cartier of Maverick Pet Partners! Chantal Cartier of Maverick Pet Partners with her cool hat, and Adrienne Carson of Live and Learn Dogs pose for a picture before the show! January 31, 2015 – Camp Bow Wow Lawrenceville comes to visit! Dr. T. with Louise McKewon and Mr. McKewon of Camp Bow Wow Lawrenceville! January 24, 2015 – Rauhaus Freedenfeld & Associates comes to visit! Dr. T. with architect Warren Freedenfeld of Rauhaus Freedenfeld & Associates! January 17, 2015 – Crown Veterinary Specialists and Emergency came to visit! Dr. T. with Dr. Wendy Ross of Crown Veterinary Specialists and Emergency! January 10, 2015 – Redbank Came to Visit! Dr. T. skying with Dr. Martha Cline and Dr. Maryanne Murphy from Red Bank Veterinary Hospital! Rachel Hilliard – Dr. T is joined by Rachel Hilliard inventor of the new app Parasight. We will also have a Producer’s Pet Project about a cat that saves a baby. Sky Paws – Dr. T is joined by Briana Boyle and Stephanie Young the inventors of Sky Paws. Also we will have a Producer’s Pet Project about CBD oil for pets. Stephanie Kowalewski – Dr. T is joined by Stephanie Kowalewski of Heavenly Hounds Dog Training as they discuss the history of her business and dog training tips. Dr. Indu Mani – Dr. T talks with veterinarian and editor of Clinicians Brief and Chief Vet Officer of Brief Media Dr. Indu Mani. Also, we have a Producer’s Pet Project! A Mix Up Episode! – Dr. T talks about an array of different topics, including online pharmacies, tick and flea preventatives and more! Plus a Producers Pet Project about The Puppy Bowl!